This is a review of the Hitachi C10FCH2 Compound Miter Saw. You will find all you need and want to know about this product here. All its features will be listed and explained. You will also be able to view a list of its advantages and disadvantages. By the end of the miter saw review, you will be able to decide whether or not this is the best miter saw for you. The Hitachi C10FCH2 Compound Miter Saw is a great tool to add to your inventory. This will be a positive addition to both professional workshops and home workshops. It is light and portable but at the same time very powerful. Both enthusiasts and beginners will find the Hitachi C10FCH2 Compound Miter Saw very satisfactory. Why the Hitachi C10FCE2 might be the best compound miter saw? This model comes with Hitachi’s Laser Marker System. This laser guidance will ensure accurate and precise cuts every time. It is turned on and off with a covered switch. It can be used even when the saw blade is not spinning. As long as the laser point is on target, your cuts will also be on target. The best miter saws are the accurate miter saws. 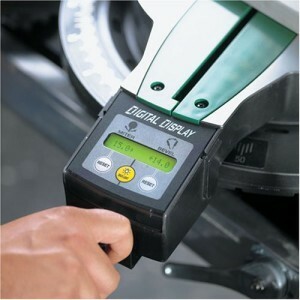 The laser marking system is a great help for better precision and more delicate cuts. Miter saws equipped with laser markers are also rare in this price range. A 10” 24-tooth TCT saw blade comes with your purchase. This stock saw is already a great saw for this miter saw review. Even this standard blade should be able to get through most common materials with ease. It will give acceptably smooth cuts every time. Even with the tougher materials, the blade cuts really well. You might want to switch to a blade with more teeth for smoother cuts but using the stock blade will work fine as well. Hitachi makes quality blades and this is no exception. This blade should prove adequate for most cutting jobs. The Hitachi C10FCH2 Compound Miter Saw is built with a 15-amp motor. This is a standard motor for non-commercial miter saws. The motor can spin the saw blade to speeds of up to 5000 rpm without loads. It is also not much louder than other saws. Portability is one of the biggest features of this product. The Hitachi C10FCH2 Compound Miter Saw weighs in at only 26.5 lbs. This is great news for those who plan to move around their miter saw. This is among the best miter saws for professionals who take their equipment from place to place. The carbon brushes that come with the miter saw are easily accessible from the outside. These can also be replaced just as easily. Replacing these will greatly prolong the life of the miter saw. Though the Hitachi C10FCH2 Compound Miter Saw is already very durable, maintenance is important even for the best miter saws. There is a flip-up fence at the side of the work space for better handling of the materials being cut. There are also other clamps to hold onto the piece you work on. Keeping the material stationary will make things easier and will make cuts a lot more accurate. This is especially helpful when working with vertical materials. The miter saw’s base has a clamping system to help keep it in place on most tables and platforms. The Hitachi C10FCH2 Compound Miter Saw can be both mobile and stationary depending on what’s necessary. The thumb-actuated stops make miter adjustments very easy. They are very accurate and convenient. The Hitachi C10FCH2 Compound Miter Saw comes with a horizontal handle. This is one of the more comfortable handle designs for miter saws. The handle also has an elastomer grip which reduces vibrations. This will make cuts and handling a lot more accurate. The Hitachi C10FCH2 Compound Miter Saw has a miter range of 0-52 degrees in both directions and up to 45 degrees to the left for bevel range. You’ll be able to make most standard cuts without straining. This model also comes with a dust collector bag. It is designed to minimize messes and clean-ups. Less sawdust will also prolong the life of the product. Unfortunately, like what many miter saw reviews say, this bag is pretty much useless. Hitachi grants all owners of their power tools with a warranty of 5 years. This is longer than most other warranties. Hitachi makes their confidence in their products’ durability apparent. The Hitachi C10FCH2 Compound Miter Saw needs assembly out-of-the-box. This is mostly easy and straightforward. Calibrations have been made in the factory so there’s no need for further tinkering. Clamping it down before doing any cuts will ensure accuracy. Using the laser guide will also help. Both beginners and professionals will like the Hitachi C10FCH2 Compound Miter Saw. It performs great in most conditions. It is also quite simple to use so beginners won’t encounter a sharp learning curve with this. Professionals will see that this saw will perform superbly in work situations. People have really been loving this product. Most miter saw reviews were very positive. There were also those proclaiming this to be among the best miter saws out there. The only thing that was disliked was the useless dust bag. This is a great product. Most people will find it satisfactory. It will fit both professional and home jobs. The Hitachi C10FCH2 Compound Miter Saw is undoubtedly durable. It also has a nicely short price tag on it. For those looking for a quality power tool, this is among the best choices you have. This review is a look at the Hitachi C10FCE2 10-Inch Compound Miter Saw. This might be the best compound miter saw model out there. Read on to find out exactly why that is. You will find out what makes this machine tick, what is so great about it, and why you should get one. This saw comes from Hitachi Power Tools. The company name alone should put any doubts on quality to rest. Hitachi has always brought out great products, including power tools. They have been awarded various awards and have definitely produced some of the best compound miter saws. If seeing the brand Hitachi stamped on your saw is not enough to allay your fears, then this should. The Hitachi C10FCE2 comes with a 5 year limited warranty. This is among the longest warranty periods in the industry. Hitachi makes their confidence in their evidently durable products very obvious. The Hitachi C10FCE2 has a lot of neat features. Among the main things you should know about is that it is powered by a 15-amp motor that can generate speed of up to 5000 rpm with no loads. It has a bevel angle of – to 45 degrees. You can set its miter range from 0 to 52 degrees to either side. Other good things about this product are its designs and considerations for efficiency and user comfort, your comfort, just like how the best compound miter saw should. The Hitachi C10FCE2 weighs only 26.3 lbs. This makes it among the lightest models in its class. It also has a handle on top to further make carrying and moving it around convenient. Hitachi has also redesigned their handles. This product has a horizontal handle with an elastomer grip. This grip was specifically designed to reduce vibrations and improve overall control, even during heavy workloads. The handle is now an enclosed D shape instead of the previous pistol grip designs. There is also an extended flip fence that can be raised to a height of 4 inches. This further improves ease when you are working with large materials. A dust collector bag also comes with the saw. It does not really do much of what it is meant to do. The company does admit this fact though and this is still better than nothing. Low price. This product offers some of the best value out there, possibly because it might be one of the best compound miter saw models. At the time of this review’s writing with free shipping at Amazon. To get the best out of your machine, it is important to nail it down. The Hitachi C10FCE2 is compatible with the HTC PM-4000 PortaMate Folding Miter Saw Stand . Still, you do not really have to spend more on a stand. It would be just as good, if not better, and a lot cheaper to build one yourself. Building your own stand will benefit you a lot more. The stand can be tailored to fit perfectly wherever you want it to in your workstation. You can also design it to handle the kinds of projects you plan on using it for. When done right, your stand should also be more stable than store-bought ones. This saw was designed mainly for home use. Home owners with projects requiring an accurate and reliable compound miter saw will find what they are looking for in the Hitachi C10FCE2. It can even hold its own against the models in the commercial class. This is the best compound miter saw for average users. A lot of professionals are also using this saw for their work. Even though it is designed for home use, it can handle its share of commercial work. Cutting all kinds of wood, boards, and even metal materials is something it does extremely well. It is also a lot quieter than most miter saws. The Hitachi C10FCE2 is an amazing piece of work. It will do what you want it to and more. You will be hard pressed to find something offering better value than this. If you don’t have one yet, you should get up right now and order one! There has been a lot attention given this particular model. And it seems almost all of the owners have nothing but good things to say about it. Yup, it’s praises all around for the Hitachi miter saw. A lot of people even claim that it is the best compound miter saw.